Three guys, two of ‘m not even twenty yet, with no other intention than to blow your mind and eardrums with fast and loud Rock ’n Roll. The Kickers from Rockcity Grunn (Groningen, the Netherlands) have become bored with soft commercial punkpop and lifeless emo. To be a part of the solution rather than the problem they decided to play wilder, faster and louder than the competion. And they succeeded! To young to drive a motorcycle they all own and drive a socalled ‘Bakbrommer’, a vehicle that was used in the past by people who couldn’t afford a car, but has now become the coolest way of transportation in the cities of Holland. This has become part of their image. And it works! Often you see them drive around with at least one beautiful girl. Who needs a Cadillac? Platex Records proudly presents their first single. 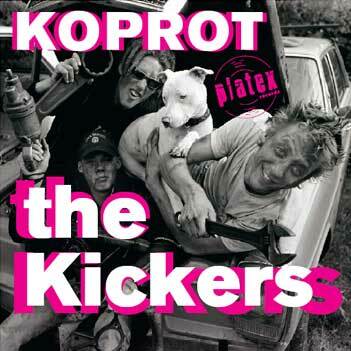 ‘Koprot’. the Blaisdell Studio by Michiel Cornelisse October 2004.